In 40 tasty, easily digestible bites you can travel round God's amazing world and pray! This book covers over twenty different countries including Algeria, China, and North Korea. It covers a variety of issues such as poverty, clean water and translation. "40 Days 40 Bites: A Family Guide to Pray for the World is a book that demands to be read and used in our ministry of prayer for the nations... I will be making use of this Prayer Guide in my own prayer ministry. Let's work hard together to get this guide out and to get people to really make use of it." So excited to bring this book into our meal time devotions! We love missions and this book has great education put into small fun lessons for the family! 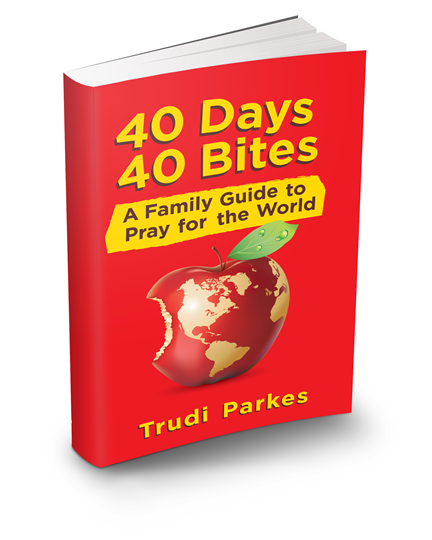 Click the button below to add the 40 Days 40 Bites: A Family Guide to Pray for the World to your wish list.